magicblue radio is broadcasting not for profit. We are a radio service operating for the benefit of the general public. We offer essential news and beautiful entertainment with no limitations of a commercial environment or a donation based financial framework. 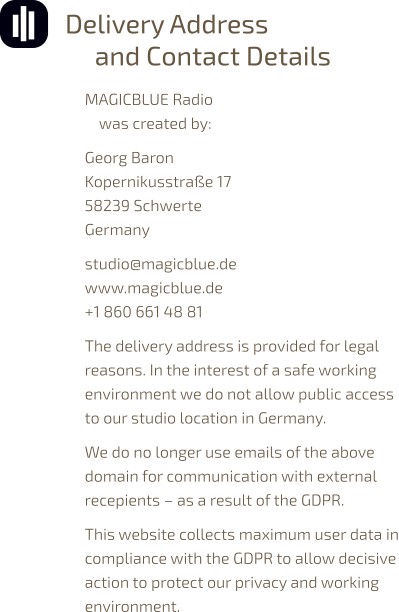 magicblue radio online streams are operated by laut.fm which are responsible for GEMA/GVL licensing. Other broadcasting services do not originate from Germany. Please note that we cannot accept bookings for advertising or promotions. Due to new European data protection legislation it is no longer a proportionate effort for us to reply to email inquiries.